A cautious Fed injected Gold bulls with fresh inspiration yesterday evening with prices jumping to a near 6-month high during Thursday’s trading session. Although the metal’s positive trajectory remains in favour of bulls, the price action witnessed today suggests that Gold could be searching for a fresh directional catalyst. While market optimism over US-China trade talks continues to reduce appetite for safe-haven Gold, dollar weakness and expectations over the Fed taking a pause on rate hikes are clearly limiting downside losses. With the geopolitical risks in the background on the mind of many investors, the fundamental outlook remains bullish. Focusing on the technical picture, Gold fulfils the prerequisites of a bullish trend on the daily charts as there have been consistently higher highs and higher lows. 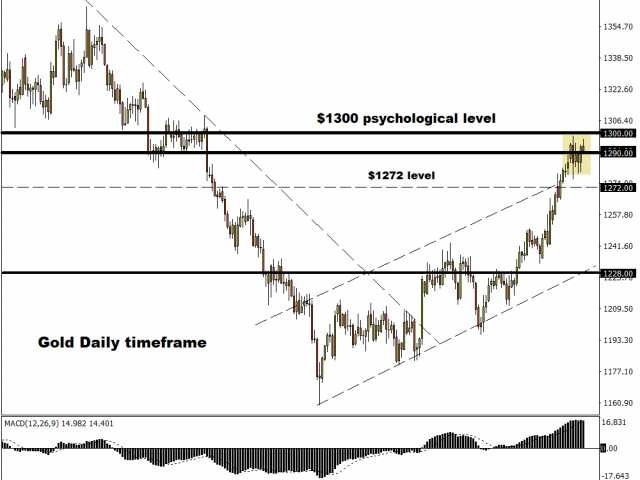 The daily close above $1290 has the potential to open a path towards the $1300 psychological level. Alternatively, if $1290 fails as a support level, prices are seen testing $1272. The Euro was offered ample support in the form of Dollar weakness as prices secured a solid daily close above 1.1500. With the Dollar likely to weaken further on Fed rate pause speculation, the EURUSD is seen venturing higher this week. 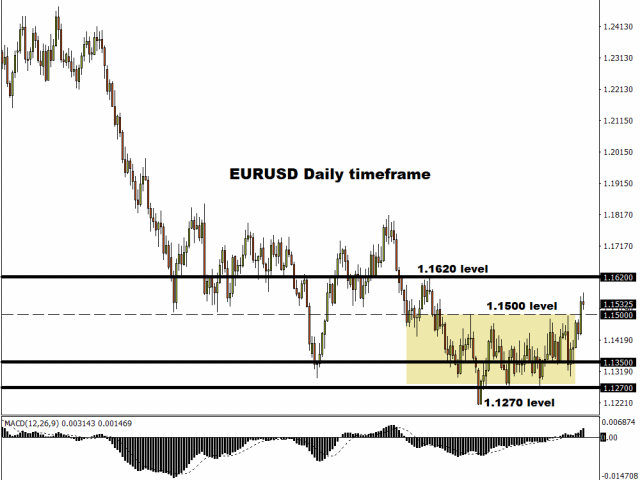 Focusing on the technical picture, the EURUSD turned bullish on the daily charts following the decisive breakout and close above 1.1500. This level is poised to transform into dynamic support that pushes prices higher towards 1.1620. If bulls are unable to defend 1.1500, prices could trade back towards 1.1350. Oil prices are being supported by Dollar weakness and optimism over US-China trade negotiations easing tensions between the world’s two largest economies. While the commodity is seen extending gains in the near term amid the improving market mood, gains remain limited by supply and demand dynamics. Oversupply fears coupled with concerns over falling demand are poised to create headwinds for oil bulls down the road. Geopolitical risks, global growth fears, China’s economy, and the Dollar’s performance are factors influencing oil this month. If geopolitical risk factors fuel risk aversion, oil markets will be one of the many casualties. Although a weaker Dollar amid US rate pause speculation may offer oil prices some support, robust production from US Shale and further signs of China experiencing a slowdown will translate to downside losses, especially when considering how Asia is a major Oil consumer. In regards to the technical picture, WTI Crude has scope to venture higher but remains capped below $54.00.